“I’ve not been drawing as much lately” is my oft-repeated excuse for laziness in posting, and while I do have a small backlog of recent sketches yet to scan, it is kinda true, and you can blame THESE GUYS. Well, that and other things (like football coaching, and all the art projects that go with it), but yes, an unusual amount of time has been spent making these little characters fly, blast, pow, and zap. And build, they do lots of building. 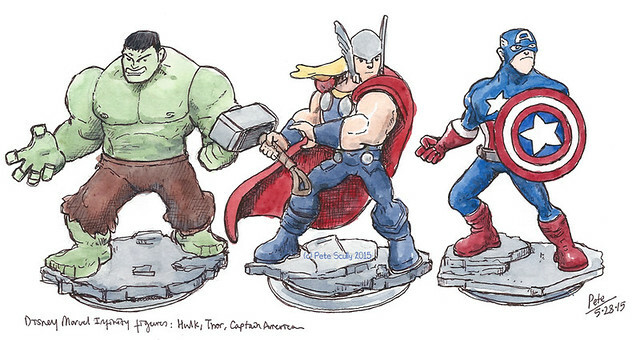 These are figures for the Disney Infinity video game, the 2.0 Marvel Super Heroes version. These are my son’s (except for the Captain America, he’s mine! ), and last week I lined some of them up to sketch in his “book of things” as I have imaginatively called the Stillman and Birn Alpha book where I record his toys and other bits as a memory for when he is older. There’s Hulk, Thor, Cap, Falcon, Nova, Loki, Black Widow and Iron Man. I’m a particular fan of Nova (but I also love the comic, the newer ones with Sam Alexander, who this version is based upon – or rather the one in the Ultimate Spider-man cartoon series). Infinity 2.0 is a fun game, which has various playsets such as Avengers of Spider-man in which you can do missions, strategies, skill challenges and beat up bad guys while playing as whichever super-hero – even Loki – you have on the little base. You build up each character’s skill set over time so that they can fly faster, hit harder, do special moves, and it’s generally a lot of fantasy fun. This isn’t one of those “Call of Duty Death Zombie Stabby-Stabby Car Thief Gang” games, thankfully (though you can be the Hulk and get a medal for smashing up cars). The real fun though is in the “Toy-Box”. There, players have the ability to create whole worlds, or complicated games, using their imagination and the various tools and toys on offer. My son has been busy building worlds he calls things like “Tree Tunnel Doom” and “Danger World”, and I have been building intricate yet huge castles brick by single brick, full of secret passageways and monsters. With Secret Wars going on in the comics right now I’m inspired to make Battleworlds, making me feel a bit like the Beyonder – “To infinity and The Beyonder” I would say, yeah you had to be there (and, like, care). We have more fun building our worlds than playing them, but we’re novices. Going online to the community toy-boxes, you can see and play in worlds built by others using the same tools, many the results of challenges set by the Disney Infinity team. One of my favourites is where someone built a copy of the Disneyland park. So if you ever wonder where all the sketches are, rest assured I am still creating, I’m just making huge space canyons filled with lava and frost giants and towers up to the sky. It’s incredible fun. The sketches are great. You have captured the poses brilliantly. My kids got Marvel Disney Infinity for Christmas and they absolutely love it. It is their “go to” video game on “screen time” days. 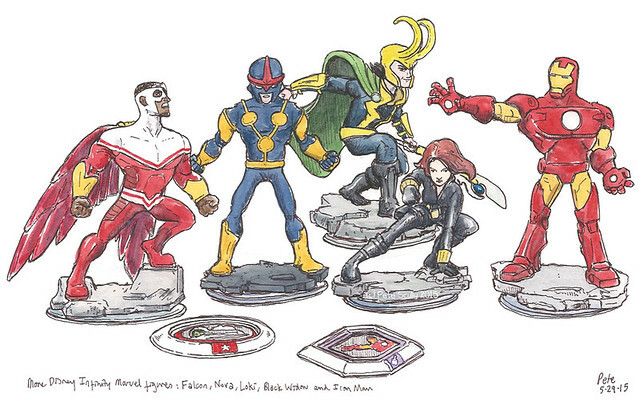 They already had Disney Infinity but that is largely gathering dust right now. It seriously annoyed me that we were required to purchase a second base board. And my heart sank when I saw they were coming out with a Star Wars version because now my kids want that and I kind of want to get it for them because we are all such massive SW geeks in this house but I also feel ripped off having to buy new base boards all the time. The figures are a good way to incentivise my kids earning pocket money though. Have you seen that there is now a Lego version too? Agreed. The figures not being compatible irritates the life out of my kids.